A 16GB Samsung Galaxy S5 treats its users to roughly 10.7GB of available internal storage out of the box, whereas the carrier-branded versions of the device provide even less. 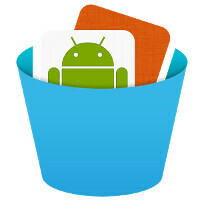 Yes, the Android OS and Google's apps take up a big portion of the used storage, but Samsung's bloatware is undoubtedly the biggest culprit for this amount of used space. In this line of thought, it's always sad to see when users receive even more bloatware after they've purchased their already-burdened devices. This is the case with AT&T's Galaxy S5 (SM-G900A). The carrier began rolling out a firmware update for the Samsung Galaxy S5 over the air, but you shouldn't be excited at all. Unfortunately for all users of the flagship, the 46 MB package contains two of AT&T's own apps, Lookout and Yellow Pages Mobile, the update also clogs the Galaxy S5 with Find My Mobile and Reactivation Lock, two of Sammy's own apps. Sigh. Although AT&T mum's the word if the update brings any performance improvements on board, several XDA users that already got the update report that it seemingly fixed an existing issue with the Recent Apps button. Additionally, some claim that the update made the interface of Samsung's flagship a tad smoother and less laggy. However, even if you postpone it a couple of times, the update will eventually force itself on your device. 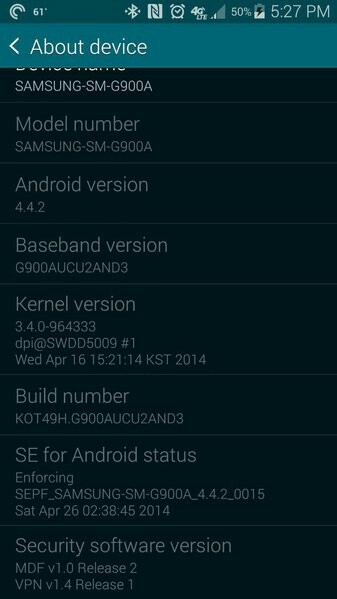 We suppose that most users won't be very excited to treat their Galaxy S5 smartphones to this bloatware-centric firmware update, but it's still a good idea to be up to date. Fortunately, the included apps can be disabled at will. You will get it soon. I have faith you will get it this week. I hope at least. +1 to you for getting an Xperia Z2. Who doesn't like a shot of EXTRA bloat on their phones? GREAT JOB AT&T! This is one HUGE reason why I love to root. Coolstorybroski. There's no root for AT&T S5 yet. And they locked the bootloader as well. Would never buy a subsidized att or aio phone again. well in their defense, alot of people brick their phones with roots and expect the warranty to cover it, lie on the exchange and never pay full price for something they have done themselves... I get this every week, someone doing this all the time. Which is why ATT/Samsung should supply a simple one-click root and allow the customers who bought the phone to root the phone without going through all sorts of BS. The M8 is simple to s-off and unlock. htcdev.com. they unlock the bootloader for you so basically buying a developer edition is ridiculous. That's true, too bad there is no developer edition like there is on the Verizon Galaxy S5. By the way I am on Verizon, NEVER on AT&T. I'm glad you've got access to a non-locked S5, but "developer edition" phones are just a scam to make more money. Any phone should be able to be a "developer edition" phone. Well they aren't more expensive, just not subsidized. Be glad someone like moto had the moto x unlockable for verizon, because that's the only way you get to do what you want on their network. And of course, apple doesn't allow it period. Screw those for sure. Any time you have to buy a phone for full retail price, it is almost always more expensive than buying it from a discounter such as Amazon, Newegg, etc. Every time you take one of those phones and use it on a post-pay cellular service, you are effectively paying twice -- once for service, once for the subsidy. Some cellular providers give you a small discount if you bring your own device, but that discount is often $15/month. That is equivalent to 33 months of phone cost, more than the 24 month contract for a subsidized phone. If the US had a government that wasn't owned by the corporations, every Android phone would have one click root and an unlocked bootloader. Sad. Samsung phone are filled with bloatware. One of them Evernote can't be disable at all. The phones are not slow by any standard. Just bloatware irritate the user like me. My Note Pro 12.2 has an Evernote App that pre-install that i can't disable that a new low for Evernote and Samsung. The rest of it i can still disable like some hancom viewers. They are changing some of their bloatware to optional downloads, User need to select the icon to initial a download. That the case for New York Time and Business Week. I prefer they do this over pre-install as user can just disable the icon and there no wastage of memory space. Samsung need to respect their user right to decide on apps. Otherwise they will lose customer. I am keeping an eye out for brands that don't install bloatware. Known any? Carriers' bloatwares can be uninstalled easily on WP8, so I don't think it will ever suffer from this. Well, unless at some point MS changes their mind. If thats so, that is a plus for WP. Its a con for Android. You can do it on Android if you are rooted or its already made available by the OEM and/or carrier to uninstall. I dont see why I would want Verizon's navigation app on a phone that has Google Maps. Let me install it if I want. I think that can be uninstalled now tho. WP are locked down just as well on att - no free tethering allowed. I have no idea of any one of them that is unlocked - putting the 8.1 update requires developer access, free, but still requires them signing it for your phone. This is why you buy an unlocked phone and go with cheaper no-contract plans. The US telecoms keep many great phones from reaching the US and don't offer the same plans pre-pay and post-pay. For instance, my unlimited data plan on ATT is no longer available. Not that my plan is truly unlimited as ATT changed the definition some time ago. But I don't get overages which is nice. I can't buy this plan now unless someone at ATT helps me out. Usually this will cost someone $100 for this "special service".